Gmail is always a superstar when it comes the matter of email services. It's proving the best email service for a long time without any difficulty. But sometimes people feel very annoyed with it because Gmail not provided any direct option to schedule emails to send later. As we all know that Scheduling email makes us more reliable and professional. It helps us to perform our works on the time and according to need. If you are also facing the problem of scheduling emails in Gmail to send later then this article is for you. We found a very useful application called "Boomerang" that works perfectly along with Gmail and allows you to take complete control over sending and receiving email messages. With this helpful app you can freely schedule emails to send later, set email reminders and email tracking etc. In simple words, we can say it offers you all the facilities to control your email messages according to your wish within few simple clicks. 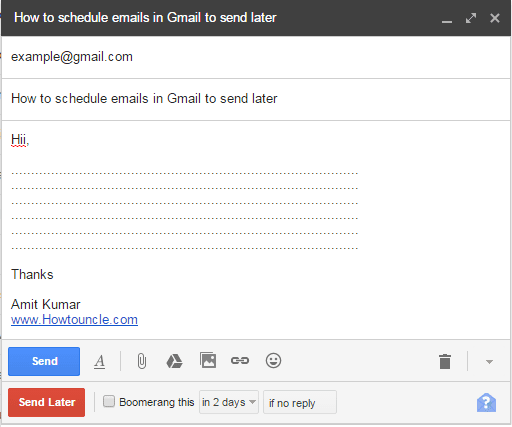 So, let’s see the step by step guide on how to schedule emails in Gmail to send later. Step (1): At first, visit to Boomerang website and click on “Add this to your Gmail” button. 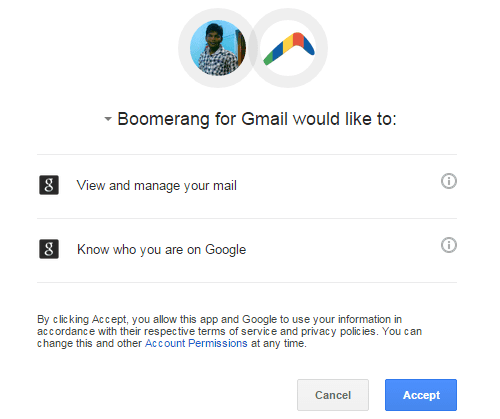 Step (2): If you are not logged into your Gmail account then it will ask you to log into the Gmail account using your user ID and password, Otherwise the extension of Boomerang tool will be added into the account automatically. Step (3): Now visit to your Gmail account and click on the Compose button to create new email. After that Create the mail by adding the email addresses, subject and message body. Step (4): Just below the Send button, you will see a Send Later option which will help you to schedule email. Now, select the time and date at which you want to send the mail and finally click on Send Later button. Step (5): After clicking on the Send Later button. You will be asked to accept the permissions. Step (6): So, click on accept option for granting third party permission to Boomerang. Step (7): Finally, hit the Send Later button. Congratulations! Your email has scheduled to send later. Now, the scheduled email will be delivered at the fixed time and date. If you found the above mentioned guide "how to schedule emails in Gmail to send later" useful for you then feel free to share your view with us through comments.